Tap Tap Revenge is the most popular game on the App Store. Lots of new features, tons of themes, points and battles, an all new catalog of more than 150 free tracks and three awesome ways to play with your friends. The latest version 2.6 will be able to send you notification when a friend send you a message for a direct battle even when the App is not running. BeejiveIM keeps you in touch with your instant messaging buddies from popular IM services like Windows Live, Yahoo, Google Talk, Facebook, MySpace and ICQ. The latest version is capable of “Push”’ing chatting notification from a conversation even when the app is not running. This will finally make instant messaging a true fun on iPhone and iPod Touch. 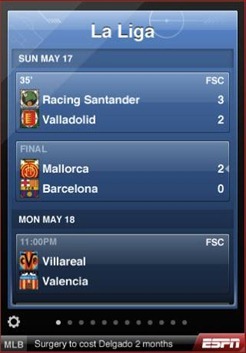 ESPN ScoreCenter brings you scores & news from over 500 sports leagues in the world. The latest version is now capable of giving key game updates even when the app isn’t running.This app is truly a must have for all the sports freaks out there! AP Mobile news helps you keep up-to-date with what’s happening anywhere, in your town or across the world. The latest version will now be able to alert you with the latest breaking news even when the app is not running. 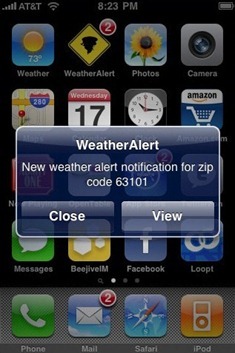 WeatherAlert is a simple weather notification application that will display alerts for your area whenever there is a chance of rain, thunderstorms, tornadoes, floods etc. The latest version will “Push” the alert message to you without you having to run the application. I would really like to see apps like Skype, Facebook, Tweetie(or any other twitter client) and any RSS Reader to get Push Notification System. Imagine the possibilities when Skype will be able to notify you of incoming call when it is not running? Free iPhone-iPhone calling over the WiFi anyone? BeeJive with Push has not been approved as yet. BeejiveIM with Push is available on the App Store.